The Wild Boys stars were due to start their tour on Thursday July 14 in Dublin and run through until mid September, but Simon has been advised to postpone the tour indefinitely and pursue a course of physiotherapy treatment after damaging his vocal chords. The 52-year-old singer, speaking from the UK where the band met for crisis talks, said: "This has been an extremely difficult decision to make as the injury I seem to have sustained is an internal one and so no-one can tell me exactly how long it's going to take to mend completely." 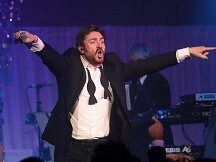 Doctors believe Simon damaged the muscles controlling his vocal chords while performing in Cannes in May, causing him to temporarily lose the top part of his vocal range. He added: "I need to take some more time away from shows to get back to full strength. If we knew exactly when that might be, we wouldn't have to let this entire run of dates go, but what we feel we can't keep doing is moving shows piecemeal - as it's just not fair on the fans. "I am doing everything I can to work through this and get back on track as soon as possible. "This couldn't have come at a worse time - but I am trying to be philosophical about my recovery as there's nothing else I can do." Once Simon has recovered Duran Duran hope to reschedule as many of the dates as possible, so fans should hold onto their tickets as they will be valid for the new dates. Details will be available as soon as the band are able to secure venues on www.duranduran.com.